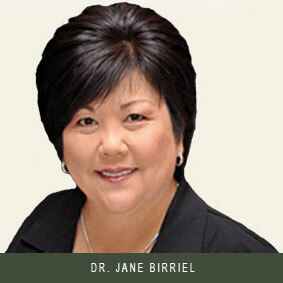 Jane M. Birriel, DDS is your choice for a warm and welcoming neighborhood dentist. A dental school graduate of the University of Missouri-Kansas City, she offers the highest quality dentistry available, and her advanced training at the world-renowned Pankey Institute keeps her on the cutting edge of both dental techniques and technology. Dr. Jane Birriel is a member of the Louisiana Dental Association, the Academy of General Dentistry, the Spear Dental Study Club, and the American Dental Association. She is also a CEREC Mentor who continues to excel through teaching and learning. She is a certified implants specialist and has done extensive training to earn a fellowship in Implants from The International Dental Implant Association. Dr. Birriel’s husband, Tomas Birriel, is a general surgeon at the Teche Regional Medical Center. They have four grown children, two granddaughters, and one grandson, who are, of course, the apples of their eyes.